IT was a brilliant spring morning in Madison Square Park, and the uptown end of the central lawn was already crowded with children playing on a multicolored triangular platform that looked as though it had been made from giant Lego blocks. The children clambered up and down, tossing balls, yelling gleefully and digging in a square of blue rubber mulch that lay on the ground beneath this structure. Their mothers and baby sitters lounged alongside them, sitting on the platform or watching from a set of adjoining turquoise bleachers. At first glance this assemblage might have been mistaken for a particularly inventive playground. 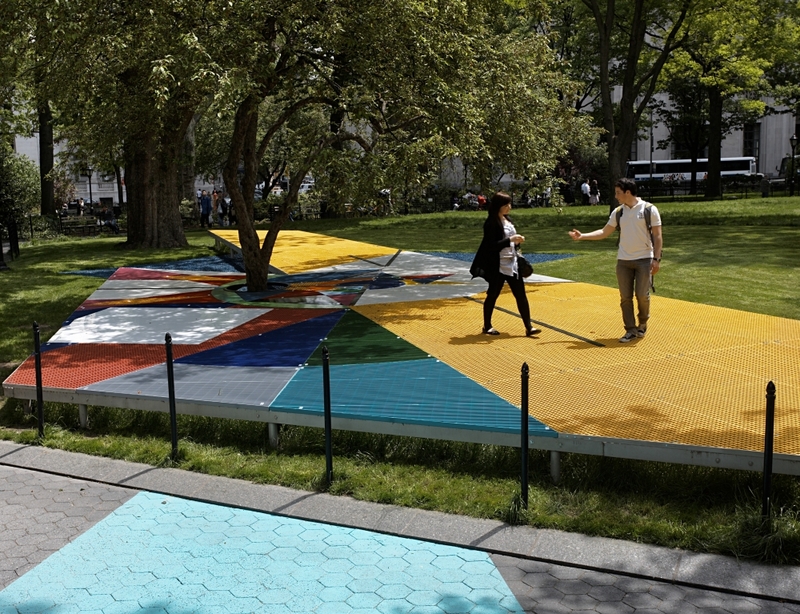 But it was actually a piece by the artist Jessica Stockholder, who was watching from the sidelines with Debbie Landau, the president of the Madison Square Park Conservancy, which commissioned the work. Both of them laughed in amazement at the unfolding spectacle. For more than 25 years Ms. Stockholder has been celebrated for site-specific sculptures and installations that challenge boundaries, blurring the distinction among painting, sculpture and environment, and even breaching gallery walls by extending beyond windows and doors. But with this piece, in the park through Aug. 15, she seems to have crossed another sort of border. "I've never worked in a place like this, with all these people and kids," Ms. Stockholder said happily, over the din of children's voices. "I didn't realize it would be such a magnet, that it would be the thing people really wanted to sit on, and that kids would like it so much." Ms. Landau said she too had been struck by the installation's instant allure. "People discovered it immediately," she said, noting that its mood changes throughout the day, with the morning rush of children giving way to a more adult lunchtime and early evening crowd. Even before the piece opened to the public, she added, she realized that it would pose an operational challenge. "The minute the blue mulch went down," she said, "we e-mailed Jessica and said: 'This is a sandbox. What kid wouldn't want to play?' And in fact by the next day a kid had made mounds and had a truck in there." (The solution: Park employees rake and reshape the mulch twice a day.) The piece, called "Flooded Chambers Maid" — a play on the concept of women's work and service work, as well as art making — has much in common with Ms. Stockholder's gallery installations. It incorporates industrial materials and ready-made manufactured objects, and its brightly colored parts combine to create something of a three-dimensional abstract painting in space. Although elements like the bleachers and the steel-and-fiberglass gridded segments that make up the platform were fabricated months in advance, the piece feels as though it were invented on the spot. And part of it was: beyond the bleachers lays a garden that Ms. Stockholder planted in a somewhat free-form fashion in April, with the help of Christy Dailey, the conservancy's chief gardener. The result suggests a D.I.Y. take of a Constructivist painting, built from plants, flowers and upturned buckets and bins from Wal-Mart. With its focus on geometry this work also suggests a nod to the surrounding architecture and streets, especially the triangular Flatiron Building, which lies just south of the park. But that wasn't what Ms. Stockholder consciously intended. "I don't sit down and think about things in that way," she said. "I walked around the park and spent time thinking about it. I made this piece in response to the patterning that was already here." In a sense this is a golden moment for Ms. Stockholder, who recently turned 50. Although she has been showing here since 1985, soon after receiving her master of fine arts degree from Yale, she has three simultaneous exhibitions of her work on view this month. As well as the park piece there is a sculpture show, "Sailcloth Tears," through June 20 at Mitchell-Innes & Nash in Chelsea. And "Swiss Cheese Field," a suite of monoprint constructions based on Ms. Stockholder's drawings for the park project, can be seen through July 2 at Senior & Shopmaker, a gallery overlooking the site. As Ms. Stockholder said, "We took advantage of the moment." She produced the prints during a handful of frenzied sessions at Two Palms, a SoHo print shop, working on several at once, with technologically sophisticated machinery and a several crew members. "It's one of the more exhausting things I've done," she said. But the sculptures were made the way she usually works: alone in her studio near Yale, where she is director of the graduate sculpture department. (She lives in an adjoining house with her husband, Patrick Chamberlain, a psychologist, and Charles, their 13-year-old son.) "I don't have assistants and things in the studio," she said. Although she works with "anything I can buy and carry," she frequently allows herself to be limited by the material she already has on hand, like buckets, bolts of cloth, paint and light bulbs, and lets her intuition guide her. "What I like about it is I don't know what I'm doing," she said. "I make things complicated for myself and chaotic, so I feel unsettled, and then the challenge is to make something structured and complete emerge from that." The park project offered yet another challenge, she said: "It involved much more planning." That planning began about three years ago when Ms. Landau, a longtime fan of Ms. Stockholder's work, mentioned her name to the committee that advises the conservancy's art program, Mad. Sq. Art. (Since 2004 it has commissioned work by living artists including Sol LeWitt, Roxy Paine and Ursula von Rydingsvard.) Ms. Landau suggested Ms. Stockholder because "I loved her use of color, the vividness, the bold collages, the geometry," she said. "What was also great was that we'd never had anything that you could quite call an installation before." The nomination was ardently supported by another committee member, Adam D. Weinberg, the director of the Whitney Museum of American Art. He first met Ms. Stockholder in 1990 when he included five sculptures in a display of new appropriation art at the museum's Equitable Center gallery. One piece, he recalled, incorporated burlap, painted Sheetrock, an old car door and a tiny orange light bulb. "What I immediately loved about them is that I couldn't figure them out," he said. 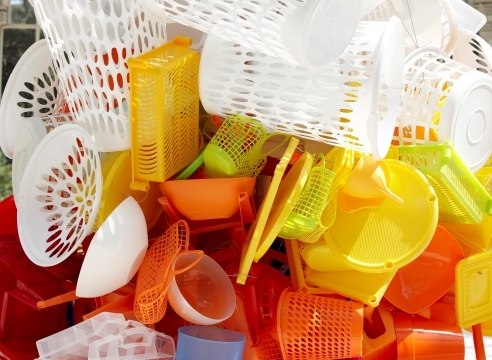 "They were somewhere between painting and sculpture and environment. The work also draws on the whole history of art from Matisse to Rauschenberg, Smithson and Gordon Matta-Clark." Mr. Weinberg was also uniquely familiar with Ms. Stockholder's rare alfresco projects. In 2002, as director of the Addison Gallery of American Art in Andover, Mass., he commissioned her first outdoor work made in this country. (The conservancy project is her second.) Made for a show called "SiteLines: Art on Main," it was installed on a vista landscaped by Frederick Law Olmstead and involved armchairs, a park bench and bleachers, and encouraged visitors to become part of the piece by luring them to sit and enjoy the view. "Her work makes you very aware of your own physical presence in the environment," he said. As for Ms. Stockholder, the current project came as a welcome antidote to traveling around the world making museum and gallery projects. "It wasn't just like arriving and making something in two weeks and leaving," she said. "It seemed to have roots in a community and a dialogue that are a little bit more substantive." So in summer 2007 she embarked on a creative process that for her was quite atypical. It involved making drawings, building a model and working with a cast of dozens: as well as the 23-member conservancy staff, the team included a production manager, a fabrication manager, two engineers and maintenance, installation and gardening crews. There were city building codes to worry about. "Debbie and I talked a lot about the size of the holes in these gratings," Ms. Stockholder said. "They couldn't be too large, because little kids would be likely to be running around, and you didn't want their feet to get stuck, and we had to think a lot about the edges of things and making sure they weren't sharp." Because the platform could be only so high without a railing, she made a virtue of that restriction by positioning it at seating level. There was also a budget of $300,000, which clocks in as the priciest in the conservancy's history (although it's a far cry from the cost of some other recent public artworks, like Olafur Eliasson's $15.5 million "New York City Waterfalls" in 2008). After the initial quotes came in, Ms. Stockholder let her imagination run away with her, coming up with ideas for more elaborate elements, like a more lushly planted garden. But last fall, after the economy tanked, her ambitions had to be reined in. Although she stuck to a couple of wish-list items, she impressed the team with her willingness to compromise on many more, from the vinyl coating for the bleachers (largely replaced by commercial oil paint) to the number of plants (scaled down). "She's a very easy artist to work with," said Ms. Landau. But Ms. Stockholder said she took these constraints as inspiration. "In some way that's what the work is about," she said. "I work in response to the limitations of any situation and in relationship to what's possible." Besides, she added, the project had given her new opportunities. "In a park," she said, you are not working with studio materials or a flat piece of paper. You have grass, and the people and the city and the daylight."